Order ID: This is Newegg Order Number created to match each client order once it is accepted. It can be used as a key to communicate with Newegg like Seller Order ID (below). * Seller Order ID: This is the sales order number clients have in their ERP system. It is used as a main key between clients & Newegg. Max character allowed is 25. 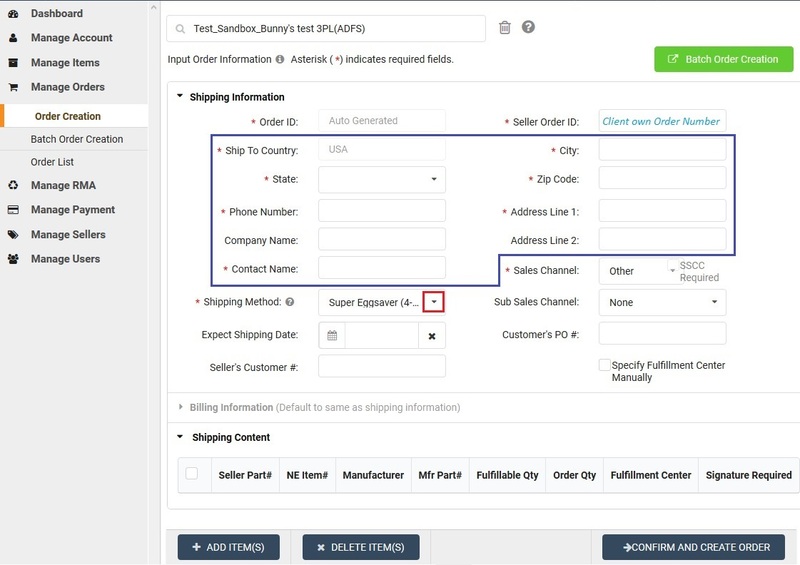 * Ship to Country, *State, *City, *Zip Code, *Phone Number, *Address Line 1 & *Contact Name: These data fields are essential and required to create a shipment. You may add additional Company Name or address indication at Address Line 2 (i.e. Suite Number) but not required. Clients can apply 3rd party billing account# of *certain parcel courier (FedEx & UPS are currently available). Please contact Newegg Account Executive for details. * Sales Channel: certain sales channel have special routing guide or instruction. The sales Channel is a flag for Newegg system to identify and filter for different handling. Sub Sales Channel: Large chain store have different regions or brands, where requires subtle difference within the same sales channel. This is where to mark it. Expected Ship Date: Order will be processed immediately after received with Expected Ship Date. You can set a future date if you like Newegg to process at a certain date. 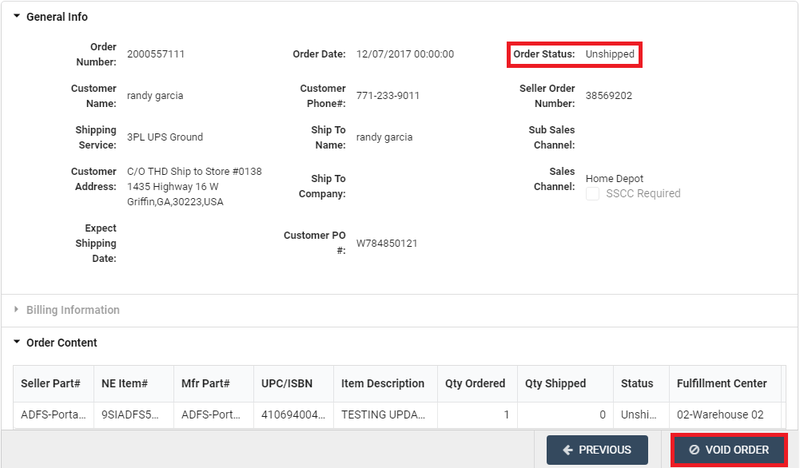 Customer PO#: the recipient of the order may have a purchase order number. Input it here so that the PO# can be displayed on shipment document (i.e. shipping label & packing list). Seller Customer#: This is customer number client assigned to order recipient. Input the number and Newegg can display it on a certain position of shipment document requested by clients (i.e. packing list). 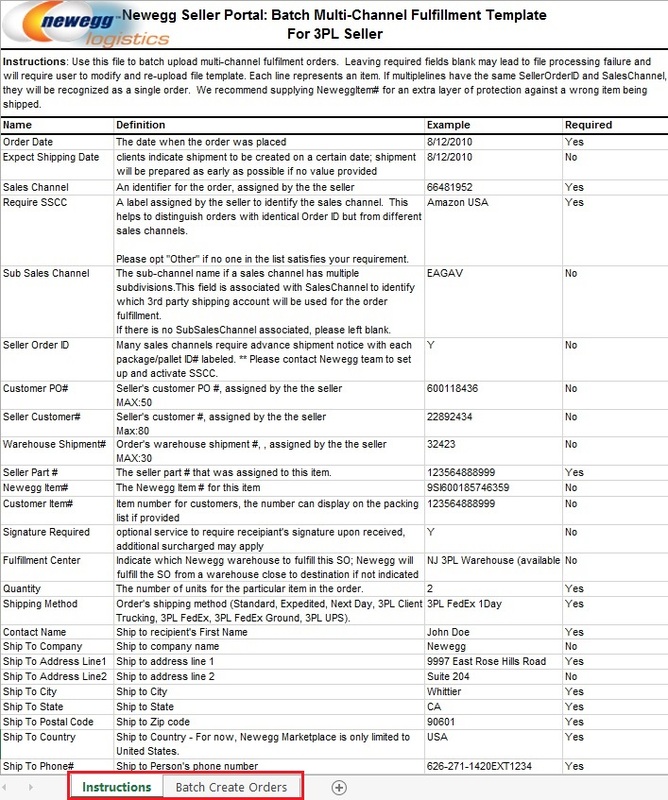 Specified Fulfillment Center Manually: Newegg will fulfill orders from a warehouse closer to recipient when there are inventory at more than 1 location by default. 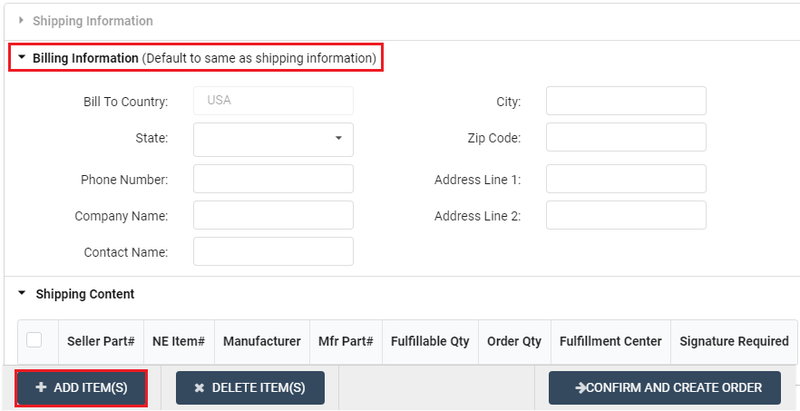 Client can check this box to select certain fulfillment center for this order. The warehouse option for each items will be check and displayed at shipping Content section (described below). User can click Billing Information to expand more optional data fields. 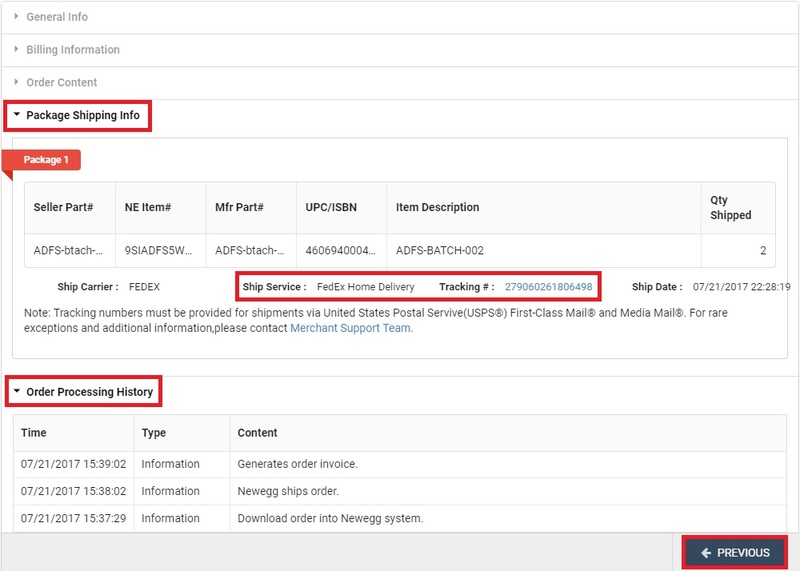 Same as Seller Customer#, Billing Information (address, company, and contact) can be displayed on a certain position of shipment document (i.e. packing list) if you enter here. User can start adding item for this order by clicking Add Item(s) button. User can search regular items by either Seller Part# or Newegg Item#, or by a BOM (refer to 3d. BOM Item List). Then, add quantity of the product ordered. 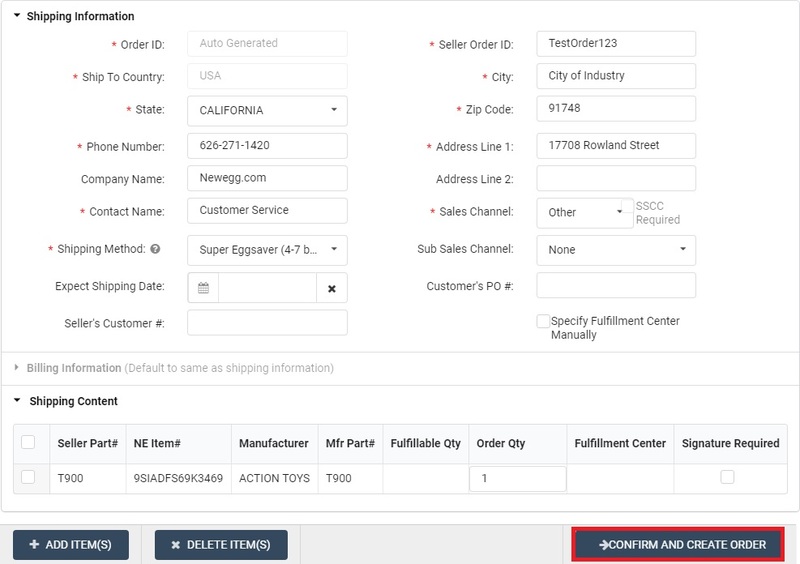 The fulfilment center can be selected if client like to determine which warehouse location to fulfill the order (refer to Specified Fulfillment Center Manually checkbox in previous step). Client can also request optional *Signature Required service for the item (* surcharge applied). User can click Add Item & Exit button to order review step, or click Add Item & Stay button to add more items for this order. User can review and Shipping Information, Billing Information, and Shipment Content if necessary. 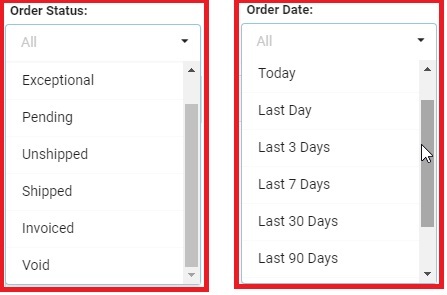 Once user click Confirm and Create Order button, an order is final and created. 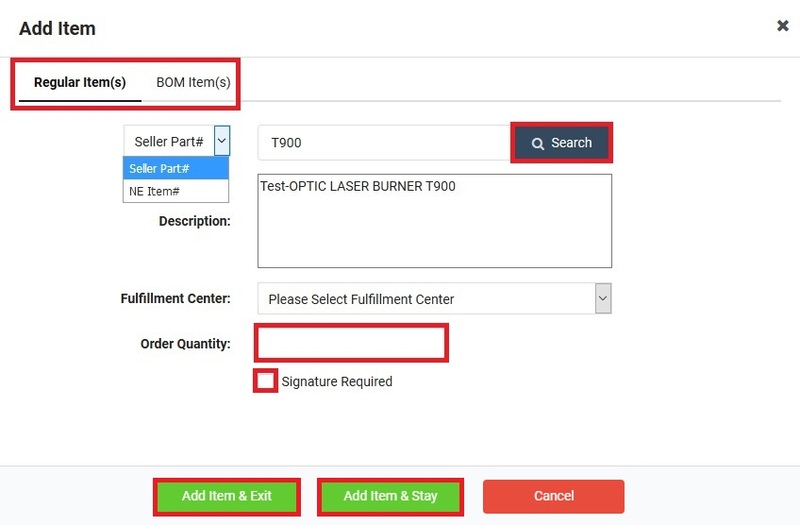 User can search the order from Order List function (described at 5b. Order Search & Void). User can go Manage Orders > Order List to search orders by Seller Order#, Newegg SO#, Customer Name, Customer Phone# or Customer PO#. User can also search by Order Status or order Date or Date range. Exceptional Missing or incorrect order data. Newegg cannot process order unless it is corrected or resubmitted. Pending Order is completely received. The order requires additional condition/decision from clients. Newegg can process it once permitted. Unshipped Order is ready to be processed by Newegg warehouses. Shipped Order has been shipped. Invoiced Order has been shipped and service charges recorded. Void Order was cancelled and not processed. Client can create and submit it for processing again. 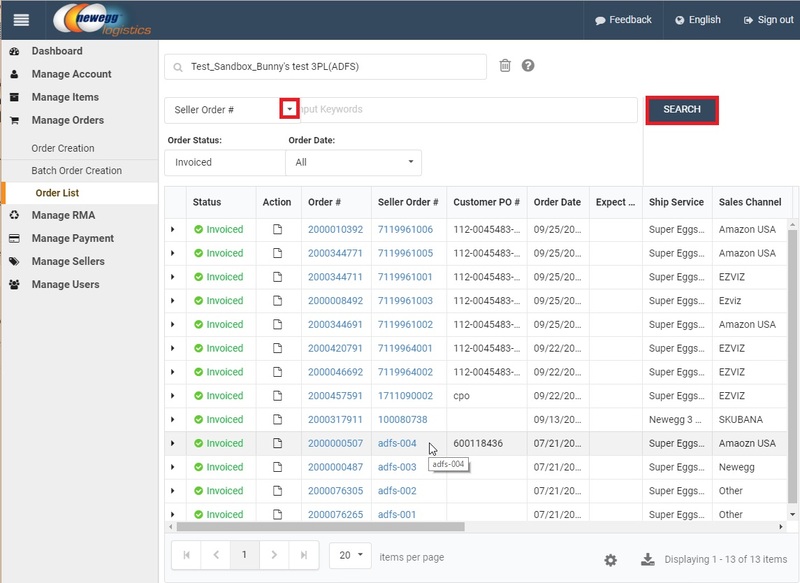 User can click any order from the Order List to see processing log & shipping record after it is processed. For a parcel shipment, user can further click tracking# to be redirected to a Newegg page where package status is displayed. For any LTL shipment, an internal reference number (usually starting with ECO) is displayed after warehouse completed order process. Actual trucking company and a PRO# will be provided after shipment pickup. User can click Previous button to return to Order List page. User has the opportunity to cancel an existing order before it is shipped. Click the Void Order button, and submit order cancellation request. 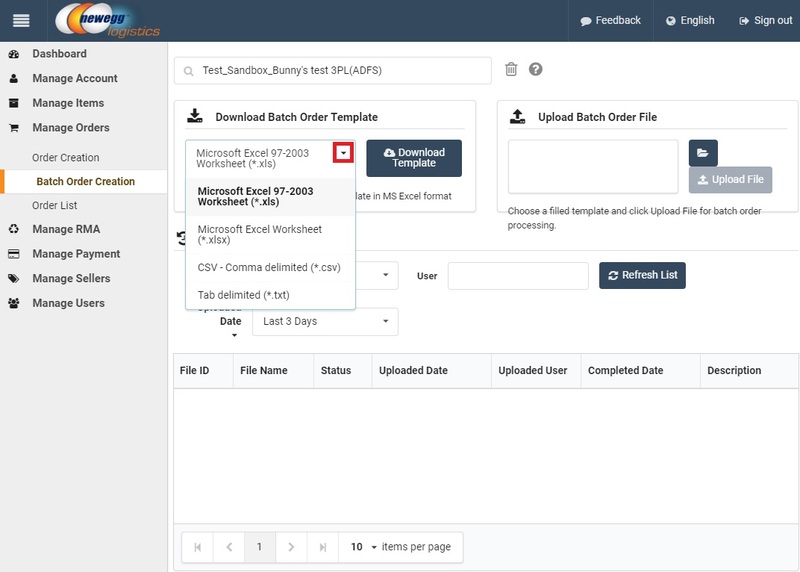 This is order creation for users who prefer to prepare data offline, and create multiple orders at once. First select a prefer data format you like to work offline, and download the template file. Save the file in your local drive to edit later. Read the instruction & definition of each data field (available in MS Excel template) before working on the file. Some required data must have values, and Newegg uses programming script to validate the Order details in the file you upload. 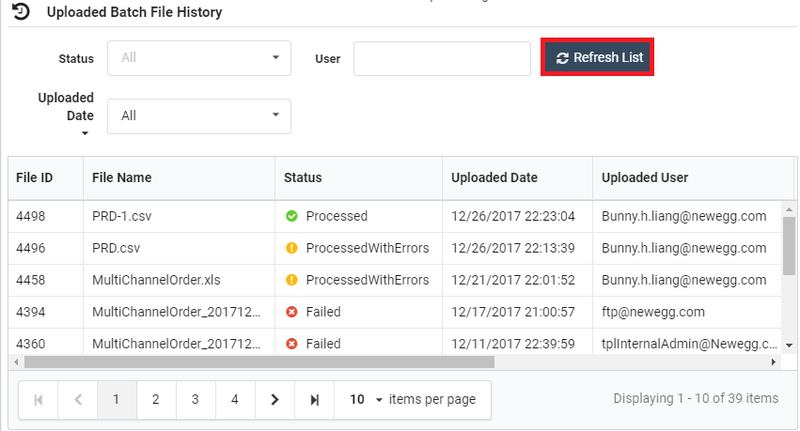 User can see view file processing status and result from History portion. To review items successfully created, user can search item from Item list (Refer to 5b. Order Search & Void). Please record client’s account credentials for a platform Newegg integrated at Manage Account > Channel Setting (refer to 2d. Channel setting). Due to the difference of 3rd party platform, Newegg IT team will go over a few checklist (i.e. Shipping method mapping between platform & Newegg services). Then a Go Live date will be provided based on mutual agreement between client & Newegg.